The prevalence of diabetes is increasing exponentially all over the world, particularly in developing countries where it is now estimated that 80% of all people with diabetes live. South Asia and the Western Pacific region are now the main epicentres of the diabetes epidemic. Indeed, China and India alone contribute about 40% of all people with diabetes in the world. However, it is not just the numbers of people with diabetes which one is concerned about. More worrisome is the increasing numbers of people with complications of diabetes. Even assuming that a third of people with diabetes would ultimately develop complications, this would mean that several million people are at risk of developing eye, kidney, heart and feet complications of diabetes. It would be virtually impossible for any health system to provide treatment to millions of people with these complications. In the natural history of type 2 diabetes, one passes through a stage of normal glucose tolerance, then goes on to the pre-diabetes stage before developing diabetes, and then finally to the stage of complications [Figure 1]. It has been shown that South Asians have a much more rapid progression to diabetes compared to the white European population. However, there is evidence to show that there is ample window of opportunity for us to intervene at each of these stages. Yet in reality, we do not intervene in time and this is what is called as ‘Clinical Inertia’. The term Clinical Inertia is classically defined as ‘Failure of healthcare providers to initiate or intensify therapy when indicated’. However, as pointed out by Khunti and Davies, this is too narrow a definition. Clinical inertia, in fact, extends throughout the entire natural history of type 2 diabetes. 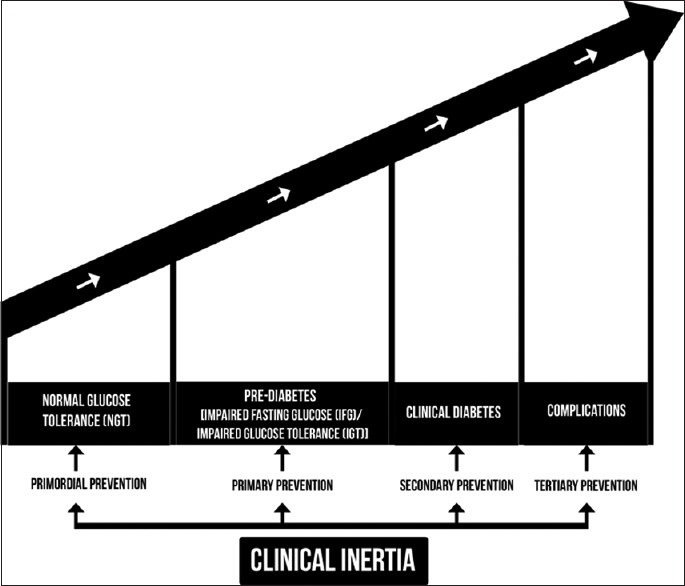 [Figure 1] also shows how clinical inertia can be present at every stage of the natural history of diabetes. [Table 1] outlines these levels of clinical inertia in detail and the consequences of the clinical inertia at each stage. At the stage of normal glucose tolerance, there is an opportunity for us to intervene in the form of Primordial Prevention. Primordial prevention refers to reduction in the risk factors of diabetes such as obesity. Thus, by healthy eating and increasing physical activity, if one is able to reduce or halt the rise in obesity rates, this will have a tremendous effect in reducing the incidence and prevalence of type 2 diabetes. However, if we do not interfere at this stage, this is the starting point of clinical inertia in diabetes as they would then progress to pre-diabetes and from there to diabetes. There should be widespread and aggressive screening at the community level if we are to pick up pre-diabetes, as it is totally asymptomatic at this stage. If individuals are not diagnosed at the stage of pre-diabetes, they can quickly move to the stage of diabetes. It is estimated that South Asians reach the stage of diabetes some 5–10 years before Europeans. By opportunistic screening as we showed in the ‘Prevention, Awareness, Counselling and Evaluation [PACE] Diabetes Project’, it is possible to identify people at the stage of pre-diabetes., This gives us an opportunity to institute Primary Prevention of Diabetes. It has been shown by several studies in the West, including the DPP Trial, the Finnish Diabetes Prevention Study as well as in the Da Qing study in China, that the prevention of diabetes is possible in those with pre-diabetes. Indian studies including the Indian Diabetes Prevention Programme and the Diabetes Community Lifestyle Improvement Program have shown that up to 30% of people with pre-diabetes can be prevented from developing diabetes. If such programs are scaled up, it would mean that millions of people in Asia can be prevented from getting diabetes. In such frail people, if too tight a control of diabetes or too much lowering of blood pressure is achieved, this could have detrimental, rather than beneficial, effects. Finally, if one is in already in the stage of complications, even here, clinical inertia can be avoided. Routine screening of all people with diabetes of their eyes, kidney, heart and feet can lead to the identification of complications in their early stages when it may be possible to reverse these complications. If this is not done, this is an important area of clinical inertia. Even if complications have set in, by aggressive control of blood pressure, glucose and other risk factors including cessation of smoking, tobacco, cutting down on alcohol, reducing stress and by good control of blood pressure and glucose, it is possible to slow down, if not halt, or reverse, the complications of diabetes. Thus, it is clear that clinical inertia could be present at every stage of the natural history of type 2 diabetes. In any population, one would find people at various stages in the natural history of diabetes, and it is our duty to educate the healthcare providers, government, non-government organisations, public and our patients about the need for early identification of diabetes, aggressive treatment, screening for complications and providing the treatment of complications wherever appropriate. If such a comprehensive diabetes programme is developed, it will be possible to reduce clinical inertia at every level and thereby reduce the incidence of diabetes or at least ensure that those who have diabetes can have a long and healthy life despite the disorder. Khunti K, Davies MJ. Clinical inertia-time to reappraise the terminology? Prim Care Diabetes 2017;11:105-6. Sattar N, Gill JM. Type 2 diabetes in migrant South Asians: Mechanisms, mitigation, and management. Lancet Diabetes Endocrinol 2015;3:1004-16. Somannavar S, Lanthorn H, Pradeepa R, Narayanan V, Rema M, Mohan V. Prevention awareness counselling and evaluation (PACE) diabetes project: A mega multi-pronged program for diabetes awareness and prevention in South India (PACE- 5). J Assoc Physicians India 2008;56:429-35. Somannavar S, Lanthorn H, Deepa M, Pradeepa R, Rema M, Mohan V. Increased awareness about diabetes and its complications in a whole city: Effectiveness of the “prevention, awareness, counselling and evaluation” [PACE] Diabetes Project [PACE-6]. J Assoc Physicians India 2008;56:497-502. Li G, Hu Y, Yang W, Jiang Y, Wang J, Xiao J, et al. Effects of insulin resistance and insulin secretion on the efficacy of interventions to retard development of type 2 diabetes mellitus: The DA Qing IGT and diabetes study. Diabetes Res Clin Pract 2002;58:193-200. Ramachandran A, Snehalatha C, Mary S, Mukesh B, Bhaskar AD, Vijay V. The Indian diabetes prevention programme shows that lifestyle modification and metformin prevent type 2 diabetes in Asian Indian subjects with impaired glucose tolerance (IDPP-1). Diabetologia 2006;49:289-97. Weber MB, Ranjani H, Staimez LR, Anjana RM, Ali MK, Narayan KM, et al. The stepwise approach to diabetes prevention: Results from the D-CLIP randomized controlled trial. Diabetes Care 2016;39:1760-7. Mohan V, Shanthi Rani CS, Amutha A, Dhulipala S, Anjana RM, Parathasarathy B, et al. Clinical profile of long-term survivors and nonsurvivors with type 2 diabetes. Diabetes Care 2013;36:2190-7. Standl E, Stevens SR, Armstrong PW, Buse JB, Chan JC, Green JB, et al. Increased risk of severe hypoglycemic events before and after cardiovascular outcomes in TECOS suggests an at-risk type 2 diabetes frail patient phenotype. Diabetes Care 2018;41:596-603.